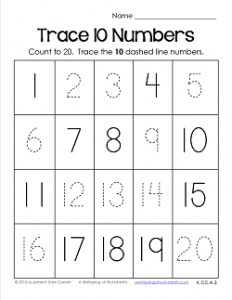 This trace 10 numbers worksheet is part of the collection of trace numbers 1-20 worksheets. In this worksheet, kids trace 10 random numbers out of the numbers 1-20. Have the kids use crayons, markers, colored pencils, what ever tickles their fancy!